One of the beauties of traveling through Europe is seeing the great layers of history in the form of buildings and public spaces. It can be a challenge, though, to find your place in time with the wide range of decorative flourishes. Impress your traveling companions on tour by learning key elements of 8 European architectural styles! This is by no means a comprehensive list, so consider it as a jumping off point for pursuing additional research. Plus your Tour Manager will provide you with plenty more background. The Ancient Greeks and Romans developed architectural innovations still used to this day and throughout our list of architectural styles, you’ll see their influence come back time and time again. Romans were more likely to use arches and intricate decorative flourishes on their columns. The Greeks favored the much simpler Doric column. 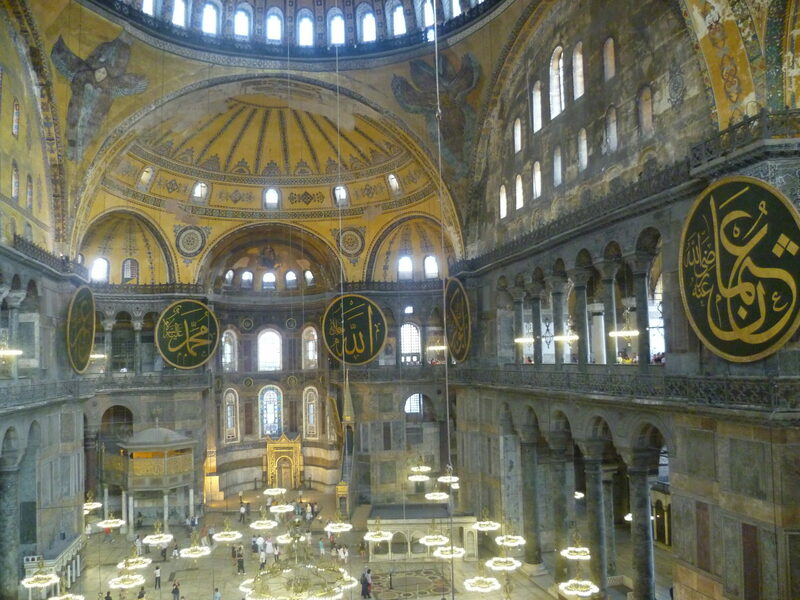 Originating in the Imperial capital of Constantinople, Byzantine archticture had influences from both East and West. Roman traditions, such as arches and columns, were used as a base and then expanded upon, most notably in support of immense dome ceilings. The stone castles and monasteries of Medieval Europe (and Monty Python) represent the Romanesque style. The massive walls and narrow windows were developed in a time of constant warfare, so decorations were often sparse: Survival was the ultimate objective. The Gothic Style followed right on the heels of the Romanesque in the 12th century CE, and they share many similarities, including stone walls and arched windows. Gothic style, however, is more intricate and buildings feature an irregular profile. Want to be able to tell the difference? Look for pointed arches in the Gothic style and round for Romanesque. Just as Renaissance artists turned to classical Greek and Roman history for painted inspiration, the era’s architects brought back antiquity in their building projects. The complex proportions of Gothic buildings were scrapped in favor of simple, clean lines. Look for symmetry on a vertical axis – You can split it down the center and left mirrors right! This is the final architectural style from the European Medieval period. It is particularly associated with England, as the style prospered during the Tudor dynasty, and the cottages and castles of the period are instantly recognizable. Decoration, decoration, decoration! The Baroque style was all about showcasing finer details, a push away from the simplicity of Renaissance buildings and, politically, from the plain-tastes of the Protestant reformation. If Baroque was all about intricate grandeur, Neoclassical sought grandeur on the ancient scale. Flat faced symmetrical buildings with Roman columns and arches symbolize the style, with some decoration but little enough to preserve clean lines. Student Ambassador Spotlight: Garrett N.